Illrian is well known for his skills with a lightsaber, and his strength within the field of Saber Arts. His ability has allowed him to become a strong Defender, protecting those around him. Illrian’s always had a firm grasp on the ability of sensing since he was young, and has grown ever stronger within the ability and his connection to the Force. Illrian Damaris was born on the planet of Tatooine about 10 years ago to two Zabrak’s, Karnath Damaris and Asarth Damaris. His parents though, were originally from the planet of Iridonia. His father was a weapons smith in one of the shops in a small village on Taooine, and was widely known for his talents as a metal forger. While his mother ran the local pub, and even ran the security. Karnath began to teach his son how to fight, and when Illrian thought he was finally getting better in his skills, Karnath disapproved, always brought Illrian’s hopes down in the fact that he thought he was going to make his father proud. His father did this in near everything Illrian did. His father was strict, and believed that there was no need for education, as he believed all a Zabrak needs to know is how to fight, how to forge his own weapons, and how to protect himself. When Illrian had turned the age of 6, his father began to take him to his weapons smith shop to learn how to forge metal. His mother always pushed the idea of education towards his father, but he never allowed it. He felt that it was not needed. So on the days his father was too busy to take him to the weapons shop, his mother would take him to a room and begin to teach him how to read and write, for Asarth didn’t agree with Karnath’s opinions on the matter of education. She believed that education was almost as important in Illrian’s life as knowing how to fight. When at home Illrian would try to stay out of the way of his father and sometimes his mother as well, for they both were quite strict with the boy, sometimes not letting him outside of his room, or making him do things he didn’t usually have to do. One day when at his father’s shop cleaning the backroom, this robed female Twi’Lek walked into the shop, appearing as if she was interested in buying something from his father. A few minutes after the lady walked in, he was able to hear some strange movement coming from inside the room, and since his cleaning of the back room was done, he decided to walk out and see what was going on. When Illrian walked out, he saw his father holding one of his newly created swords. He was shocked and surprised that his father would hold a weapon up to a customer. When his father had noticed he walked out, he told Illrian to grab a pike from the back room, when Illrian did this and walked over to stand beside his father, he was scared, not knowing what he was actually doing or why, but he knew that if he disobeyed his father, he would be punished when he got home. As he stood beside his father, the lady drew and ignited her lightsaber, cut Illrian’s pike in half and then pushed both him and his father with a telekinetic wave. Illrian ended up behind the counter, while his father was pushed into the door that led outside, breaking the door and rolling in the dust a few feet. When he stood, he dusted himself off and looked evilly towards the Twi’Lek Jedi, then mumbled something to her as he ran off, the people noticing this begin whispering amongst them, wondering what will happen of him, now that his father was gone. The Twi’Lek walked back inside after almost ignoring the people that had gathered around, she was looking around, but suddenly looked over at him only briefing, then she asked if he was related to the man that had just ran off, and he acknowledged, speaking softly that the man that ran off was actually his father. He was curious about where his father had run off to and asks the lady where he had gone. She told him that his father had done wrong, and that she was there to solve it. She looked down at the boy once again, and asked him if he had anywhere that he could go, anyone that would be able to take care of him. He shook his head and spoke softly, saying that his mother had already fled the planet now that the news of her husband’s business was now common knowledge, and so he had no one that would be able to take care of him, as she was all he had. He then lifted his head, a slight tear of both happiness and sadness was rolling down his face, he then walked back around the counter and stood in front of the lady, and asked if she needed any help with solving this wrong doing, for he knew some things and thought he could have been some help. After providing the information he had about his father to the lady, and staying with her during the investigations time, the criminals were brought to justice. The father of Illrian was among them. Then the Jedi he had been with for the whole time, revealing to be a Jedi Knight named Aayla Vigil, offered Illrian the possibility to come with her to the temple on Yavin IV, at least for the time being, knowing that he had no one else to take care of him. He looked up at her and nodded, thanking her for asking and that he would have been glad to go with her. A smile grew over his face; he had finally met someone that treated him nicely. They went aboard Aayla’s ship, the Bluebird, and headed for Yavin IV. Before Illrian came to the Temple on Yavin IV, he had never heard about a Jedi or the Force, but after spending time with everyone at the Temple, attending classes and learning all he could at the time he began to realize that he really wanted to become a Jedi himself, because he felt that what the Jedi stood for was the same as his own feelings, and so began to get more involved with everything he could; getting to know all the Knights and Masters, attending as many classes as he could, and learning all he could about the Jedi, the Force, and how to serve the Force’s Will. This paid off in the end. On 280.17 ABY, the Council initiated Illrian and Arendur both at the encampment of Alzoc III. When Illrian was initiated, he was scared at first because he felt he was going to screw everything up, but after that feeling had left him he was overly joyed that his dream of being allowed to try and become a Jedi was coming true. He was given his training hilt, his new datapad, and the access card to get into the initiates dorms. Illrian did everything he could to train hard, and not let the Council regret their decision for making him an initiate. He trained every chance he could with every Master he could find, trying to learn as much as possible during those times. During Illrian’s time as an initiate, the Order he was with had moved to their new temple there at Alzoc III, a snowy and cold planet but was safe from danger. The war had started happening, and some of the Jedi there were signing up to help fight against the Mandalorian’s and the Chiss, including some of Illrian’s friends Daereon, Delmi, Fane, and Zeak. Illrian wasn’t happy, because he feared for his friend’s lives and didn’t want them to get hurt, but he soon tried to get rid of his feeling of fear and turned it into the feeling of hope, hoping his friends knew how to protect themselves and each other. Illrian didn’t like the violence and the killing the war brought, and made a promise that he would never join the war, because he felt it was not where he belonged. Illrian was happy when he spoke with Master Vigil about his friends leaving for the war, because he also feared that she would be leaving as well, but when he found out she decided to stay and not join that’s when he started feeling hope instead of fear. Illrian had begun training harder there at the Temple while his friends would be off fighting in the war, and made sure to train alongside them when they were around. Daereon had kind of taken Illrian under his wing and helped Illrian improve his skills with the lightsaber, helping him learn to not charge right at the enemy but go around and get them from their openings. Illrian started seeing Daereon sort of like an older brother, and always made Daereon, and the others, promise they’d always return in one piece each time they left for another mission in the war. Illrian also started to train other aspects besides his saber arts when he was placed under the Padawan Clan Keelkana, which was ran by Master Tomoran Serevarno and Master Maloush Paroveid. Illrian didn’t strive to be the best in the Clan, but strives to always make sure he was doing the assignments and getting them turned in as quickly as he could while also taking his time. It wasn’t long before he had completed the entire first unit of the lessons. While Illrian was working on completing Unit 2 of the Keelkana lessons, his other dream had become true. On 282.9, Master Aayla Vigil had asked for him to join her for a conversation, and the first thing that came to Illrian’s mind was he had apparently done something wrong and was now in trouble, because he never expected what was about to happen. After some time speaking with Master Vigil, Illrian was beginning to realize he wasn’t in trouble, but something else was up, and that’s when Master Vigil looked down at him and said she was taking Illrian as her Padawan Learner. Illrian was so happy he wanted to hug her, but he knew that wasn’t the right behavior and so restrained himself. He gladly accepted the ability to be Master Vigil’s Padawan, and ever since he has done all he can to make her never regret taking him, because his dream ever since learning about Masters and Padawan’s was to be taken on as Master Vigil’s Padawan Learner. In the year of 283, the day of .09 the High Councilor’s Master Soh Raun and Master Corinth Alkorda held a special Council session that was open to everyone. The reason for this being was that the High Council felt that after many years of service to the Council as Council Advisor’s, both Master Aayla Vigil and Master Arkallon have been granted the respectful honor of being placed on the High Council. Illrian felt slightly emotional to see his Master granted the privilege of being appointed High Councilor, but has also had to understand how much more responsibility this new position has brought to Master Vigil, and in such Illrian would see less of his Master, but still strives to train all he could under her when he had the chance, and also under others to show his Master that he is dedicated to his training, and to continue doing what he can to prevent bringing a bad image onto Master Vigil through his actions. During the following years after being taken as Aayla Vigil’s Padawan Learner, Illrian has grown physically, emotionally, and mentally through his training. He strives to always better himself, feeling his skills in whatever field he is talking about at the time are never good enough, sometimes could be considered be-litting himself. Illrian’s made his strong point grow within the Saber Arts as he continues to train hard in that field, doing all he can to constantly improve. While Illrian spends the majority of his day time training against holograms and under Master’s, he usually spends his mornings and evenings in his dorms or the Garden, meditating. Illrian’s strong point lies within his Saber Arts, but he does what he can to constantly better his other abilities, always pushing himself harder and surpasses his limits on a near daily basis. During the year of 285, Illrian’s training had shown he is capable of handling himself out in the Galaxy to an extent, and his Master began to accept missions for the both to begin handling. Since Illrian’s arrival to the Temple on Yavin IV back in the year of 280, he hasn’t left the Temple grounds, he’s remained within the safety of the Temple walls, never having to truly worry about danger since their move to the secret Temple on Alzoc III. When mid-year of 285 came around, Illrian was confronted by Master Vigil that they were to be sent out to the world of Arabanth in an investigation of the Queen Mother of Hapans assassination attempts. Someone was trying to assassinate the Queen Mother, and it was the duty of Master Vigil and Illrian to discover who was behind it. After they arrived and conducted their investigation, but running short on time, they gave their suspicions to the new Queen Mother, who was the Daughter of the Queen Mother that was killed during Master Vigil and Illrian’s time on Arabanth. After their time on Arabanth, while on Coruscant, a Senator who was friends with the Jedi Order contacted Master Vigil about his son missing, and asked for help in locating him. Master Vigil accepted this task, and so Master Vigil and Illrian went into one of the sections of Coruscant in hopes of finding the Senator’s son, which in the end turned out successful. The Senator’s son ended up being in deal with one of the local gang leaders, who then kidnapped the son for ransom. When Master Vigil and Illrian found the son, and the gang leader, both were arrested for their criminal acts and sentenced to time in prison. It was during their time on Coruscant that Illrian went through some of the shops there, and got himself a few new outfits that he thought was pretty neat, along with getting a small earring places within his left ear. Illrian hasn’t been asked about his earring yet, not even by his brothers Eugen, Baelin, or Olim. This can sometimes prove to be a good thing as Illrian doesn’t want to try and explain why he got such a thing. Near a year passed since Master Vigil and Illrian’s mission to Arabanth and then investigation on Coruscant happened, and Illrian had furthered himself in his training. During one of Master Serevarno jump courses, Illrian ended up falling off for about two hours when the falling took it’s toll on his right knee as it snapped when he hit the ground. This was the first time in many years that Illrian felt real pain, but didn’t begin shedding tears on the matter until Master Serevarno injected him with a lighter bacta type medicine, which caused Illrian’s muscles to spasm. His knee began healing, but has left some nasty markings around his knee due to the snapping. Illrian didn’t let his knee stop his training, however, as a day or so after the accident he was back on his feet, sparring everyone and training in his Saber Arts more, being stubborn as Illrian tends to be. He was always uncertain if his Master ever found out, but he does know she never came to him about it and got on him for not stopping when he should have, as he usually does. On 286.24, Illrian went to A-48 to get some pain medication for the pain that was in his knee, from smacking it against the walls during his spars against Eugen. When he arrived, he noticed Master Vigil in there getting a check up of some sort, as she feared she got some type of virus when she went on a trip to the Capital. When she was done, she informed Illrian that they were going to be heading to Socorro within the hour. Illrian didn’t quite understand what was going on, but he understood they’d be leaving for a day or so and went to pack up, making sure he got everything ready before leaving. About an hour later, he met up with Master Vigil at the hanger entrance when they went and got themselves ready in a ship to take off. Before taking off, Master Vigil began getting Illrian used to how the ship worked, how to start the engines and check to make sure nothing was open before taking off. After about an hour of showing Illrian how to get the ship ready for takeoff, and to then take off, they began their journey for Socorro. While on their way, Master Vigil then explained to Illrian what their mission was. There was a droid aboard a ship on their way to the GA Command Center on Socorro that had vital information that could turn the tide of the war in the GA’s favor, when the ship went out of communication as it entered the atmosphere, only to be found shot down or something. An investigation was already done of the ship, where no one survived and the droid was missing. A few hours later, Master Vigil and Illrian arrived at the crash site where Illrian began to investigate to figure out just how the ship was taken down while Master Vigil scouted around, ensuring no one was going to surprise them. During his small investigation of the crash site, Illrian discovered that the ship wasn’t shot down, but was sabotaged to crash. It was during this time that Master Vigil contacted Illrian, informing him that a group of swoop gang members of some sort were headed for the ship. At first, Illrian remained inside the ship until some of them were about to get in, and to stay out of danger Illrian quickly jumped onto the roof and hid, waiting for the guys to leave. While they were leaving, one remained inside the ship and heard Illrian up top, and began shooting for him. Master Vigil contacted Illrian, telling him to stop the guy before he got the others attention, and so Illrian thought fast and jumped down, cutting his arm off and then knocked him out. When Master Vigil arrived, she asked if Illrian recognized the armor, and that’s when Illrian remembered Master Azra’el’s armor, which belonged to Mandalorian’s. It became clear to both Master Vigil and Illrian that the Mandalorian’s not only caused the ship to come down, but probably also in possession of the droid. They quickly got back into their ship and followed the others who were on their swoops, making their way through a cavern towards a village. Illrian and his Master had to go through the cavern on foot as the ship was too big to get there, and when they reached the village they found it burning in flames, nearly everyone killed. As they followed the Mandalorian’s destruction path, they came across a burning sand crawler; dead jawas sprawled across the valley. Illrian’s emotion of anger began to sweep into his mind when they began entering the sand crawler, encountering some of the Mandalorian’s who stayed behind to look for the droid or something. Illrian and his Master killed the Mandalorian’s, but quickly got out of the sand crawler after not finding the droid. They escaped just in time as the sand crawler blew up. Illrian’s anger started to take him over, as he seeked revenge against the Mandalorian’s for the slaughter of the innocent civilians and jawas, when Master Vigil calmed him down before reporting to the GA Commander about the situation. It was during this time that the GA Commander said they followed the Mandalorian’s to what appeared to be their base inside another cavern, and were going to bomb the base to ensure the Mandalorian’s didn’t get a hold of the droids information. Illrian protested to this, as he felt that the Mandalorian’s had innocent people within their base and didn’t want more to die, and so pushed for him and his Master to go and find the droid, so the bombing wouldn’t be required. Master Vigil agreed, but the GA Commander didn’t and said the two had an hour before the bombing started. The two quickly made their way to the Mandalorian’s base, breaking into it and began killing all the Mandalorian’s that got in their way of finding the droid. During this time, Master Vigil was badly hurt in her arm, as blood was flowing down her arm from the open wound. The bombing had also begun to start and boulders were falling all around, so Illrian and his Master had to hurry. When they reached the end of the cavern, they discovered the droid, surrounded by Mandalorian’s, most carrying blasters while two carried blades. Illrian quickly took out the blaster wielding Mandalorian’s, and had no choice but to just destroy the droid, while Master Vigil held off the two with blades. When Illrian was finished, Master Vigil ordered him to just run as fast as he could, and despite wanting to stay and help her he listened and ran for the ship, starting it up and getting ready to leave. Illrian was waiting for his Master to return before taking off, but she never showed and Illrian feared the worse, definitely when he felt her presence telling him to take off and get out of there. Illrian struggled with the thought of leaving his Master, but in the end he took off and got to safety when the GA Commander contacted him. He informed the Commander that the droid was destroyed, but feared they had lost Master Vigil, when suddenly her voice came on over the channel and tears of happiness filled Illrian’s eyes. She was able to make use of some boulders that were falling around her and jumped out, getting picked up by a GA ship. Illrian got to the Command Center where his Master was in the medbay getting checked out. A few days later the two returned to Alvoc III, where Illrian continues his training. Over the years Illrian’s become more open to his own feelings, his anger mainly. After the mission he and Master Vigil went on back in the year 286, Illrian’s anger got the better of him, controlled him many times during the later hours of the days, where he would express his anger in manners that weren’t Jedi-like. An instance of his lose of control was one night, he allowed his anger to get the better of him in-which he punched a wall, cracking open his knuckles as a response. This allowed Illrian to see just how bad he had gotten in allowing his anger to control him, and began meditating to get himself under control and keep control over his emotions. This in turn allowed Illrian to grow stronger in his emotions, realizing just how real the danger of letting them control his actions could become. Over the next few years, Illrian’s training was growing stronger with each passing day. New boundries for him to cross, new limits to push, more challenges set in front of him to beat. His knowledge of the Force has grown stronger over the years, allowing him to do more with it and feel he has a stronger connection with it. The strongest connection Illrian has with the Force is probably his knowledge of environmental control, something he’d been working on for many years. His knowledge is centered around being able to properly move and manipulate the element of water through the Force, and his ability to do such a thing grows stronger with each day. Illrian had been on a few different missions with his Mentor over time, allowing him to see how the Galaxy around them was evolving due to the war. Illrian went on a mission with Master Vigil, Master Quell, and his Padawan, Herenai, where they all left for Yavin IV to retrieve Master Vigil’s bluebird, somewhere in the forests on the planet. During this time, Master Quell left the three as he went to the Temple, in hopes to find anything that was left behind by the Mandalorian’s. As he left, the three went on their way through the forest, looking for the Bluebird. After some long walks, encountering a holwer in the process where both Illrian and Herenai got attacked, thankfully not leathaly though and the three continued. After a while, they came to the place Master Vigil remembered her ship being placed, but due to the thick of the Forest, the three split up to search for it…where Illrian and Herenai encountered a woolamander stuck on a bridge due to a mine. Illrian got hit by shrapnel when the mine blew up near him, but the two continued on walking until they found the Bluebird and called for Master Vigil. After finding the ship, the three went back to Alzoc III to drop Herenai off, but during that period Illrian was unconcious, laying in the medical bay of the ship because of his injuries. When he woke up, he discovered he and Master Vigil were on their way to Tatooine, a trip Illrian had been looking forward to for over a year by now. While on Tatooine they would hope to discover who the true owner of the Krayt Dragon Pearl Illrian possessed belonged to, in order to return it because of the way Illrian had gotten it. However during this time, the person Master Vigil was hoping to meet up with was missing, later discovered wanted. Neither Illrian or Master Vigil trusted the new person in charge of the security, so while Master Vigil stayed with him she sent Illrian to find Barkson, the man she was hoping to meet with. During this time, it was to be made to believe Illrian was returning to Alzoc III to get the Pearl for Lortak. Illrian found Barkson, and his friends later that day, where he found out Barkson was ran out of his position by Lortak, then made wanted so that they wouldn’t cause more trouble for Lortak’s plans. Illrian also met a woman working with Barkson during this time, a woman named Brika. Illrian felt, because his Mentor trusted Barkson, he could do, and so helped Barkson in removing Lortak from the power he had. In doing this, Illrian also came about the power cell for his hilt, and the metal for the outer casing. A couple years after the mission to Yavin IV and Tatooine, Illrian had begun feeling extreme pain within his arm, pain that was keeping him from performing at the top of his abilities. He finally broke down and spoke to the medical droid about the issue, where A-48 suggested that the only way to fix the issue would be to remove the arm and get a cybernetic one. The idea alone made Illrian cringe, but he had no other choice as far as he was aware. He was unable to get a hold of the healers there at the Temple, or his Master. However, the day before the operation he ran into his Master, where he explained to her what the issue was. She told him to hold off the surgery, as she wanted a second opinion so got in touch with the Circle of Healers on Coruscant, specifically Master Bauther. After sending in Illrian’s medical records, they asked for the two to come to Coruscant and allow them to have a personal check with Illrian. Illrian was overly happy with the idea, simply because it would allow him to keep his arm. Illrian and Master Vigil left for Coruscant, where Illrian would meet with Master Bauther and find out the true reason for his arm pain, and was given a lot of pills that he needed to take daily, followed by an appointment one year later. After the trip to Coruscant, Illrian and his Mentor left the Temple and headed to the couple missions they had in front of them, keeping the pair away from the Temple on Alzoc III for near a year. During this time, Illrian came across all the required pieces for his hilt. The two returned to the Temple on Alzoc III for a short time, having to leave less than two cycles later for Illrian’s check-up appointment with Master Bauther on Coruscant. Many years passed and Illrian’s abilities in both Saber Arts and his Sensing through the Force has grown ever stronger under the training of Master Vigil. Many situations have happened to the pair, including Illrian’s time on Dantooine to face some trials and be granted his own saber crystal, the Crystal of the Guardian. Not long after this Illrian went with others from the Alzoc III Temple to help aide the Dantooine Enclave in its restorations after the war had finally ended through a peace treaty. His connection to his Master has grown stronger through the many years of training, and a bond formed between both Illrian and Master Vigil that would somewhat scare Illrian at first, not understanding just what the feeling and thoughts truly meant until it was more explained to him. After a few more years under Master Vigil’s training, both Illrian and Johauna Darkrider were brought before the Council and tasked with a mission to find an artifact that Master Vigil and other Seers had seen through a vision, the artifact was strongly connected to the Dark Side of the Force, and because of this Master Creed was to accompany the two Padawan’s on this mission. When the three got to Kesh and began their investigations, they were met by a dark man and before anyone knew anything, they all woke up in cells. Johauna got out of her cell and soon released Illrian, when the pair would travel through the place in search of Master Creed…only to find him in a cell they weren’t able to open, but were drawn into a room. There, standing in the other end of the room, was the same person…a man who called himself Darth Syphon. After discussions between the three Syphon eventually attacked the two Padawan’s, and took them both near to death. Illrian only returned to consciousness after hearing his Master’s voice in his mind, almost as if to grab him by the hand and pull him back on his feet. When Illrian woke Master Creed was standing above him, and the three left to return home where the two Padawan’s would stay the night in bacta tanks to help heal their wounds, both severally scared from the intense torture brought onto them by Darth Syphon. The Padawan’s could feel a connection between themselves growing, however Illrian was unsure what it meant at the time. After a few days, the pair was summoned to the Council once more to both deliver their report and to be informed of news about where Syphon and a mission Jedi Knight are most likely at. This time, no chances were taken and the original three were now paired with Master Vigil herself. So the four of them would venture to the planet and eventually ran into Darth Syphon, who used droids to try and stop everyone. At the beginning Master Creed stayed behind to hold off the droids as Illrian, Johauna and Master Vigil ventured forward…only for Master Vigil to soon perform the same. Illrian and Johauna quickly found themselves alone, venturing onward to try and find Jedi Knight Pendred and confront Darth Syphon if needed. The two quickly were faced with both the Knight and Syphon, and once more were placed under the torture of Darth Syphon, pleading to Knight Pendred to let go of the corruption and aide them, and soon the Jedi Knight did just that…saving both Illrian and Johauna. When everyone returned to the Temple, Illrian and Johauna were brought before the entire Council body; Jedi Master Raun, Jedi Master Vigil, Jedi Knight Akiada, and Jedi Knight Creed. They delivered their report on events after separating from both Master Creed and Master Vigil, and after discussing this the Council felt both Padawan’s had demonstrated great connection to the Force, great skill and everything that it takes to become a Jedi Knight. On 298.25 ABY, both Illrian Damaris and Johauna Darkrider were granted the title and honor of Jedi Knight of the Order, finishing their training as students and becoming a true Jedi, though their training is far from over. Since Illrian’s Knighthood, he’s investigated some dealings involving both his father and a sister that he didn’t know he had. After a little over a year of being Knighted, Illrian felt he was ready to take on his own personal Padawan and requested that the Council grant him the privilege of taking Padawan Sawyer Snow as his own. 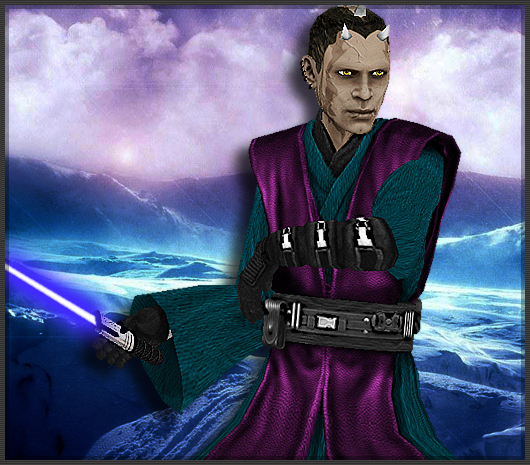 The Council granted this request, and Illrian strives to pass everything Master Vigil taught him onto his own Padawan. A few years passed, Illrian and Sawyer growing closer together through the Force, training hard and facing their fair share of challenges. Sawyer appeared to be dealing with a conflict from a man that he didn’t know, and it was starting to weigh heavily on the pair throughout their training and Illrian felt it was time to finally confront the man and stop him. The two spent a year tracking him down with no success. He spent time taking both Sawyer and Eugen Darkrider out together, helping them grow as brothers in the Force and learn to trust each other and understand each other. During an outing on Tatooine to uncover a mysterious illness that had swarmed over Illrian’s daughter, the three discovered who looked to be dark Jedi who were, apparently, working for Illrian’s father, Karnath, in hopes to use his daughter’s illness to get to him. This initial plan proved ineffective, and after defeating the dark Jedi, the three took Illrian’s daughter to Coruscant to be healed, and while they were there a servant of Karnath somehow got into the Temple and kidnapped Illrian’s daughter, pushing him into a frenzy that took control of his emotions for a few days…before he regained control of himself, and returned to Alzoc III with the two Padawan’s. Over the next year or so, Illrian tracked down his father to try and rescue his daughter but was always stopped before he could finish his mission. Time passed and Illrian decided to focus on his Padawan’s training once again, and so the two pushed forward in training, Illrian pushed Sawyer harder than ever to prepare him for the unexpected. On an outing with Sawyer and Kieran Orion, a quake struck and caused rubble to crumble from a bridge the three were under, crushing Illrian’s arm from the elbow down and splashing water into Sawyer’s eyes, causing an infection to spread and kill his eyes, leaving him physically blind. Illrian quickly rushed the three to Coruscant in hopes to heal Sawyer’s sight and his arm, but both turned out to be ineffective. Illrian received a cybernetic replacement for his left arm, and Sawyer remained blind…refusing to take cybernetic eyes. Illrian had begun to feel like a failure.. failure to protect his daughter, failure to protect his Padawan. He sent Sawyer and Kieran back to Alzoc III while he stayed on Coruscant for a few cycles in self-reflection. During this time, he tried getting used to his new addition, but Sawyer began to worry for Illrian and came to Coruscant to visit his Master. During this period, a Chistori working for Karnath arrived and took Illrian’s wife, Brika, captive…tempting Illrian and Sawyer both to fight. However, Illrian was in no shape to even hold his lightsaber, yet alone fight. Sawyer knew he was no match for the Chistori, but in an attempt to protect both Illrian and Brika, he fought the Chistori…giving the couple time to flee, but during this Sawyer’s life was taken, causing Illrian to feel like a bigger failure…his Padawan was dead because of his inability to act. This caused Illrian to spend time in more self-reflection, only this time he did so on Alzoc III, where he was surrounded by the presence of his fellow Jedi brethren. 305.01 ABY, and Illrian’s spending time in conversation with an old friend from the Coruscant Temple, Urai Vrook, a Talortai Jedi Knight. With the combined strength of the two Knight’s, along with some others from the Coruscant Temple, Illrian hopes that he’ll be able to face his father and end the conflict and turmoil, rescuing his daughter at the same time. Not long after the death of his father, Illrian had taken a deep interested in a student named Rui Vuusen, and the two began to work closely together in training. Illrian took Rui out of the Temple on a few different occasions to have deep meditation and conversations, learning more about the student. Within a few cycles, Illrian had taken Rui Vuusen as his second Padawan.. hoping to redeem himself from his failure in teaching and protecting Sawyer Snow. Over time the two got close, Rui Vuusen seemed to want to practically follow in Illrian’s footsteps which made it easier to train the student in his mind, and they’ve faced some strong challenges throughout the years together. One of the biggest challenges the duo faced was when they left to help a mining facility, where the two were separated and Rui Vuusen was sent on by himself where he later faced a Jedi who had turned away from the Order. Later the two had traveled to Kamino where they faced this Jedi once more, and after a hectic battle they brought him into custody. Outside of training his Padawan, Illrian’s faced many trials throughout his own personal life. He’s been raising a daughter that seemed to have a connection to the Force, and it lightened Illrian’s life when she was accepted into the Order and soon traveled to the Enclave on Dantooine where she would begin her training. Illrian spent a while in discussion with the Council there, and was able to arrange his daughter to visit the Alzoc III enclave before her training got too in-depth. To have his daughter around the students he trains put a smile onto Illrian’s face that would soon fade and not be seen for a few cycles. Not long after his daughter returning to the Dantooine Enclave, she became ill with a disease that had apparently been with her since both, and the sudden change from Dantooine’s climate to Alzoc III’s and then back had started the disease up, and within two days her life faded and she had joined with the Force. The news of her death nearly sent Illrian over the edge into a rage. He left the Alzoc III enclave not long after receiving the news in order to give his daughter the proper funeral she deserved as a Jedi student. Since his daughter’s funeral, Illrian’s turned himself away from being the happy Zabrak his once was. He’s let himself fade away a bit and its shown in his actions towards things. He hasn’t slept since her death, but instead go’s day by day through meditation. Both Illrian and his wife decided to get facial tattoo’s that they felt would represent their daughter for as long as they survived. While on Coruscant getting the tattoo, Illrian also felt it was time to get his proper arm back, and visited Master Bauther once more after the many years since his original arm problem when he was a Padawan, and had the cybernetic arm removed and replaced with an artificially grown arm.